Something I’ve always liked about video games is the wide variety of game you can find within the confines of a single genre. After my last review of a stylish, well-made platformer like Shio, I’ve reviewed another platformer on Switch – but this time, it’s very different. This is Sigi: A Fart for Melusina, a gloriously retro-styled platformer, with 8/16bit style graphics and a low-brow sense of humour, so of course I was going to get on well with it. But is it everything I want in a game, or was I left wanting more? Sigi is a short but fun game. With 20 levels including four bosses (and we’ll come to them in a minute), you can see your way through this game in an hour or less – though if you are aiming for 100% there are a fair few little secrets to find, which do enhance the replayability. It has lovely controls, fun music, and an effective set of weapons. 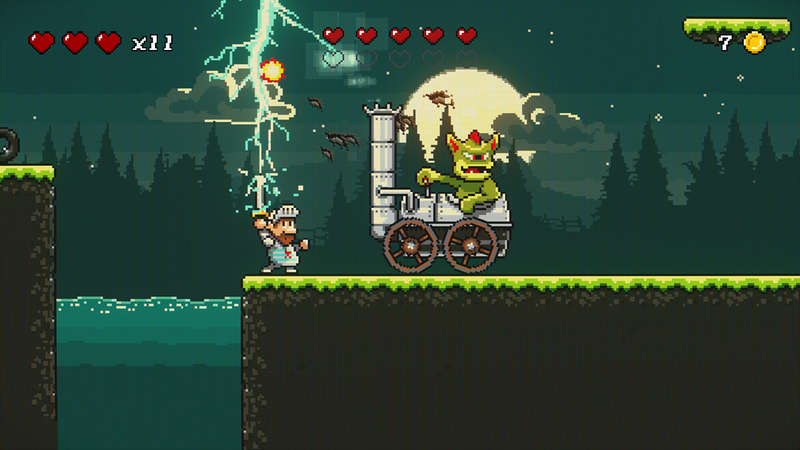 In fact the whole thing reminded me of the classic Ghouls ‘n’ Ghosts, which was clearly a big influence here. However, and I hate to be negative so early on, but it’s never going to be remembered in the same way as the wonder that it Ghouls ‘n’ Ghosts (well not for me anyway) as it suffers from a few minor but distracting flaws. The first of these, and the one that I felt was it’s biggest flaw, is the level design. The levels are designed in a perfectly competent fashion, but at no point are you left astounded by the way a level unfolds, or given any additional platforming challenges or… well, anything really! The levels are so interchangeable that I couldn’t tell you any particular features of any one level in particular, which is a real shame. Essentially, they feel as if they were just put together in a platform game maker, where someone’s just shoved some platforms and coins and chests around, thrown a load of enemies at it and gone “that’s it, I’m done”. Sadly the short levels (the average level length is a couple of minutes) mean that no sooner have you started it, than you’ve finished it. And with all 20 levels belonging to the same world map, the backgrounds and environments stay pretty similar throughout. In fact, the only levels that are memorable are the boss levels. They are quite neat little bosses – nothing hugely original, but they do strike a good balance between being their weaknesses being obvious enough that it’s not frustrating to figure out, but at the same time different enough from each other that you remember all four individually. It’s a shame, then, that the difficulty is ramped up for them. And not in a good “once I practice more, I’ll be good at this” kind of way, more in a “You’ve knocked a couple of hearts off the boss, let me send some of the irritating bird enemies to try and knock you off platforms and just generally get in your way while you fight him.” kind of way. And maybe I’m just bad at these bosses, but in comparison with the difficulty level of the rest of the game, I felt that the sudden hike at each boss was unfair and frustrating – and the final boss particularly is a right pain! My other big issue with the game is one I have none-too-subtly already mentioned – the length. Yes, it’s a cheap game (less than a fiver at time of writing) and it does say that it’s designed for the completionists and speed runners who want a short game to try, but it just feels… incomplete. In fact, the world map feels like it should be world one of more worlds, not just the entire game on it’s own. I also don’t understand the need for referencing farts in the title. Yes, Sigi does a fart as the climax of his little victory dance he performs at the end of every level, and one of the bosses farts a bit at you, but other than that the farts seem erroneous to the whole thing. I went in expecting toilet humour, maybe even farting as an attack, but then… well, there’s none of that at all. Which makes me wonder why the fart needs to be mentioned in the title at all? It seems a bit of a half-hearted effort, and they could surely have squeezed out a couple of puns – I mean, no-one would be a-GAS-t at that, surely? So with all of this moaning, you probably think I didn’t really enjoy this. But you would be wrong. I stick by everything I said before, that it’s never going to be considered a classic, it’s too short, the levels aren’t particularly well designed, and the difficulty of the bosses is way too high in comparison with the actual platforming levels themselves – but in spite of all of this, I never got bored with this game. It’s cute, it’s fun, and while it’s a bit frustrating, it’s one that will probably get a few plays in the future when I have a little time to kill. Well done Sigi – I went into this expecting a toilet humour filled, immature rushed game, and I got a competent, fun and colourful little platformer. It’s not the best, but it’s fun while it lasts.